Forgot Password or Need to Activate Your Account? 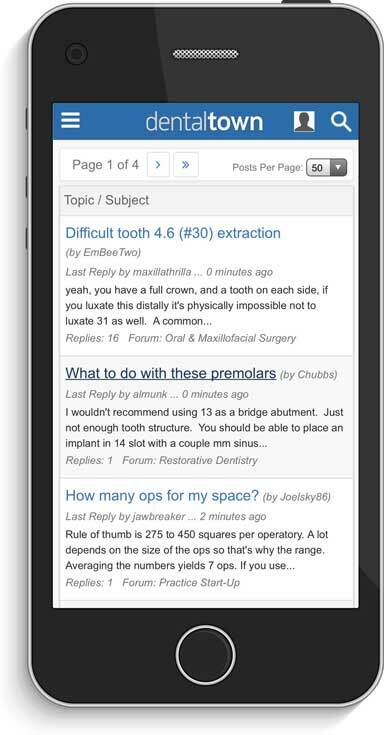 Discuss cases, practice management tips and more with over 235,000 registered members on Dentaltown.com! We're more than just a monthly magazine—it’s online continuing education, discussion forums, podcasts and classified ads that help members better themselves and their practices. Join today for free and become a part of the largest online dental community! Discuss anything and everything dentistry with your fellow Townies. Read the latest issue of Dentaltown magazine. Stay up to date on your CE credits with Dentaltown CE. Find local listings to buy and sell with Townies. Listen to the latest Dentistry Uncensored or upload your own! Read community blogs or create your own! Never miss another post, message or alert by downloading the Dentaltown app on your android or IOS device!